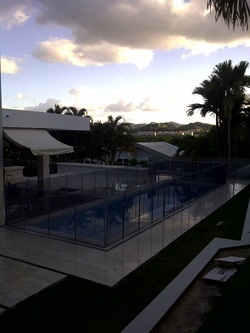 Pool Guard of Puerto Rico has been in the pool safety business for over 7 years on the island of Puerto Rico. Pool Guard manufacturing has been in business for over 20 years. We have the installation experience, quality products and manufacturing experience that is needed to secure your pool. Our objective is to provide you the best possible service at the best possible price to make your pool safe for your children, grandchildren, neighbor's children and even pets. We offer a wide variety of pool safety products including pool safety fences, pool safety nets, pin down pool safety covers and automatic pool covers. No matter what type of pool protection product you need, Pool Guard of puerto rico has the widest selection of high quality ASTM certified products. We cover the entire island including Culebra and Vieques.